Canon sells their line of consumer-grade camcorders under the Vixia model name. Vixia camcorders range in price from $279 to $1,189. The Canon Vixia line has been extremely popular over the years, for good reasons. They are high functioning, yet easy-to-use camcorders with useful features such as an input for an external microphone. Most consumer grade video cameras do NOT have that feature, so when Canon included it, they helped set the Vixia line apart. 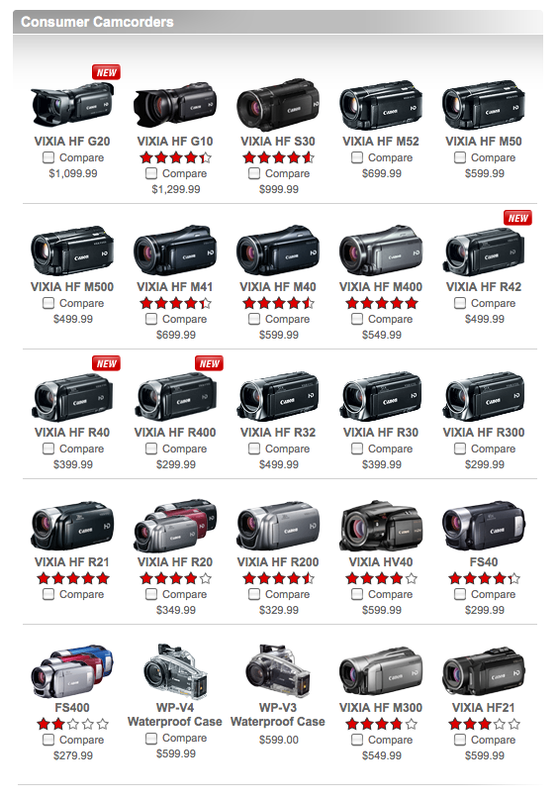 Screen shot off the Canon website showing the entire line of Vixia Consumer Grade camcorders. All but the very cheapest model (The FS 400 at $279.99) of Vixia have the mic input, which is a feature so rare for a consumer grade camera that a Vixia would be tops on my list for that one reason alone. It’s that important for serious video production and it’s quite helpful to have that in an otherwise awesome grade of video cameras. WHY IS HAVING A MIC INPUT ON A VIDEO CAMERA SO IMPORTANT? If you’re going to do videos of people speaking, a mic input on your camera is essential because the absolute best way to get good audio of a person speaking is to have the mic close to their mouth. Rarely is it ok to have the camera right in someone’s face (within 2 -3 feet). Unless you can be that close, you simple cannot rely on your camera’s mic for quality audio of someone speaking. How quiet your room is makes a big difference as well. The only way to get good sound is to use a second microphone, usually a lavalier mic pinned to their clothes, and then plug that mic into the camera at a distance of 10 or more feet. If your camera does not have an input for a mic, that kind of blows that plan! Home movie cameras rarely need such a feature so manufacturers didn’t provide it, but Canon sees a more diversified market and wisely included mic and head phone jacks. The headphone jack lets you ensure that the audio you’re recording is quality. 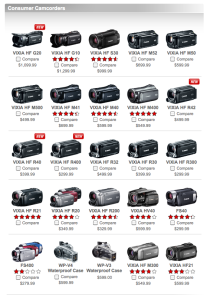 As you can tell by the screen image off the Canon website, the Vixia line includes a long list of models. Twenty-five in fact! If you check the spec sheets, although there is some overlap, the models do indeed differ in significant ways, with different sensors, lenses and capacities. Some record on removable cards, others on HD, others still on mini DV tape. Within this line of consumer grade camcorders, you can find precisely your cup of tea! But of course with so much choice comes a lot of confusion. A lot of people do not realize exactly what the specs mean in terms of real use so I have attempted to provide some perspective here. With all the variety of the Canon Vixia video camcorders. I have laid out some of the differences in the following models in a series of posts. See which one is right for you! About the Author: Lorraine Grula is a longtime lover of video cameras, having working in the television industry since the days when 3/4″ U-Matic was the latest and greatest invention. 🙂 She now operates this blog, Video Production Tips, and provides online video consulting and video production services for clients worldwide. Contact Lorraine today.